Synthetic peptide (the amino acid sequence is considered to be commercially sensitive) within Human beta Tubulin aa 400 to the C-terminus. The exact sequence is proprietary. WB: Human beta I Tubulin recombinant protein; Zebrafish whole lysate; Xenopus tropicalis lysate; Drosophila whole lysate; UMNSAH/DF-1, MDCK, MDBK, COS-1, HeLa, Jurkat, A431, C6, RAW 264.7, PC-12, and NIH/3T3 whole cell lysates; Human fetal brain and fetal kidney lysates; Mouse brain and Rat brain lysates. IHC-P: Human cerebral cortex, Human kidney, Human glioma, mouse cerebral cortex and rat cerebral cortex tissues. ICC/IF: HeLa cells. Flow Cyt: HeLa cells. Our Abpromise guarantee covers the use of ab179513 in the following tested applications. The immunogen of ab179513 has 67% identities with beta I Tubulin. The WB image shows it cross-reacts with beta I Tubulin. Human beta I Tubulin is an in house recombinant protein (aa1-451) with a proprietary tag. Immunofluorescent analysis of 4% paraformaldehyde-fixed, 0.1% Triton X-100 permeabilized HeLa (Human epithelial cells from cervix adenocarcinoma) cells labeling beta Tubulin with ab179513 at 1/1000 dilution, followed by anti-rabbit Alexa Fluor® 488 (ab150077) secondary antibody at 1/500 dilution (green). Confocal image showing cytoplasmic staining on HeLa cell line. The nuclear counter stain is DAPI (blue). 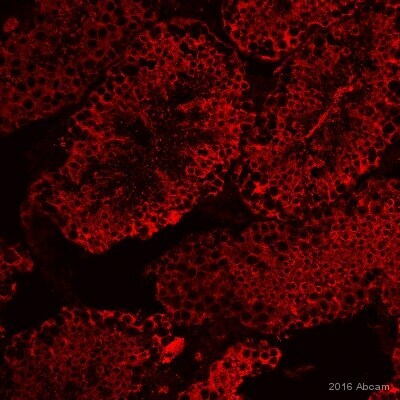 Tubulin is detected with ab7291 (anti-Tubulin mouse mAb) at 1/1000 dilution and anti-mouse AlexaFluor® 594 (ab150120) at 1/500 dilution (red). -ve control 1: ab179513 at 1/1000 dilution followed by anti-mouse AlexaFluor® 594 (ab150120) at 1/500 dilution. -ve control 2: ab7291 (anti-Tubulin mouse mAb) at 1/1000 dilution followed by anti-rabbit Alexa Fluor® 488 (ab150077) at 1/500 dilution. ab179513 staining beta Tubulin in adult mouse testis tissue sections by Immunohistochemistry (IHC-Fr - frozen sections). Tissue was fixed with paraformaldehyde, permeabilized with 0.1% Triton in PBS and blocked with 3% BSA for 30 minutes at 20°C. Samples were incubated with primary antibody (1/10000) for 1 hour at 20°C. 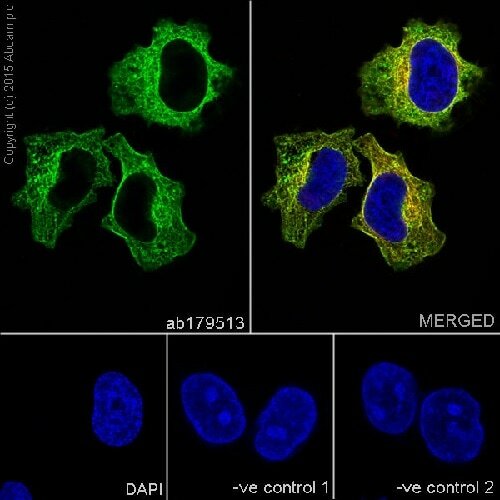 ab150062 (1/500) was used as the secondary antibody. Flow cytometric analysis of 2% paraformaldehyde-fixed HeLa (Human epithelial cells from cervix adenocarcinoma) cells labeling beta Tubulin with ab179513 at 1/150 dilution (red) compared with a rabbit monoclonal IgG isotype control (black) and a unlabelled control (cells without incubation with primary antibody and secondary antibody; blue). Goat anti rabbit IgG (FITC) at 1/150 dilution was used as the secondary antibody. The amino acid sequence of ab179513 immunogen is identical to those of tubulin beta 2A, 2B, 3, 4A, 4B, 5, 6 and 8 at the same region. Immunohistochemical analysis of paraffin-embedded Human cerebral cortex tissue labeling beta Tubulin with ab179513 at 1/250 dilution, followed by Anti-Rabbit HRP (ab97051) at 1/500 dilution. Cytoplasmic staining on neurons of human cerebral cortex is observed. Counter stained with Hematoxylin. Negative control: Using PBS instead of primary antibody, secondary antibody is Anti-Rabbit HRP (ab97051) at 1/500 dilution. Immunohistochemical analysis of paraffin-embedded Human kidney tissue labeling beta Tubulin with ab179513 at 1/250 dilution, followed by Anti-Rabbit HRP (ab97051) at 1/500 dilution. Cytoplasmic staining on tubules and the glomerulus of human kidney is observed. Counter stained with Hematoxylin. Immunohistochemical analysis of paraffin-embedded Human glioma tissue labeling beta Tubulin with ab179513 at 1/250 dilution, followed by Anti-Rabbit HRP (ab97051) at 1/500 dilution. Cytoplasmic staining on human glioma is observed. Counter stained with Hematoxylin. Immunohistochemical analysis of paraffin-embedded Mouse cerebral cortex tissue labeling beta Tubulin with ab179513 at 1/250 dilution, followed by Anti-Rabbit HRP (ab97051) at 1/500 dilution. Cytoplasm staining on neurons of mouse cerebral cortex is observed. Counter stained with Hematoxylin. Immunohistochemical analysis of paraffin-embedded Rat cerebral cortex tissue labeling beta Tubulin with ab179513 at 1/250 dilution, followed by Anti-Rabbit HRP (ab97051) at 1/500 dilution. Cytoplasm staining on neurons of rat cerebral cortex is observed. Counter stained with Hematoxylin. Publishing research using ab179513? Please let us know so that we can cite the reference in this datasheet.